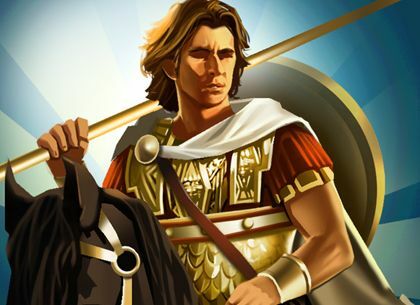 Home > Intel > Alexander the Great – the greatest leader of all time? Who is the greatest of all time? ‘My boy, you must find a kingdom big enough for your ambition. Macedon is too small for you’, the words of King Phillip II of Macedon were prophetic as he addressed his son Alexander after he had tamed a fearful horse at the age of just 10. Alexander would grow up to be one of the world’s most legendary military commanders. Born into an era of petty tyrants and brutality Alexander the Great used the exceptional education he received – from, among others, Aristotle – and used it to marshal his forces in nearly impossible battles. He emerged victorious over the course of 13 years of battles from which was forged one of the largest empires the world has ever seen. Although not exactly what one would call a diplomat, he was a military genius who used guile, ingenuity and lateral thinking to defeat often vastly superior forces. His greatest victory was at the Battle of Gaupamela in 331 BC in what today is Iraq. The Greek language was also a tool that Alexander the Great wielded with great purpose. Prior to the expansion of his empire there were hundreds of little spoken languages, when he imposed the use of Greek, it created a common language that fostered the expansion of culture, commerce and hegemony amongst the conquered lands. Above all else Alexander the Great was a commander because of his sheer bloody minded arrogance and his belief in his own superiority. He knew he was right and through his charismatic dominance he controlled, after all he firmly believed he was a direct descendent of Achilles. This belief was instilled in him from an early age by his father and his tutors at school, church and in the military. When he died in 323 BC, in suspicious circumstances at the age of just 32, he left behind a huge empire in which a cultural revolution had started but which was always on the brink of a fall into chaos. Former infantry officer and military historian Mark Corby begs to differ with this opinion. Alexander was the Philospher King. He led militarily but also understood how to really build an empire that would follow you, even those conquered. The man brought down the greatest empire the world had seen, seemingly without difficulty and within a matter of just a couple of years, conquered most of the known world while fighting far from home, never lost a battle, led from the front, was tutored by Aristotle and maintained his passion for philosophy throughout his life, spread Greek culture across the globe … you get the idea. Oh, and he did all of this before the age of 33. Perhaps the clincher, however, is this: Julius Caesar weeped when he considered Alexander’s accomplishments. He had an undefeated battle record. Upon his death, Alexander had conquered most of the world then known to the ancient Greeks. He conquered most of the known world, frequently doing things that were widely believed to be impossible! And I’m named after him! For the age in which they lived they were by far the most advanced technological and militarial civilization in the world using many inventions and techniques that still hold sway today. All of this held under a system that in equal measures was democratic but extremely ruthless. Tremendous lasting impact in both military and cultural spheres – his tactics are still studied 2300 years later. All would be rulers of the world were in awe of Alexander. His story, based largely on legends of his persona, is everything a military leader wished to be in life (handsome, bold, fearless, an artist and a dashing warrior). In reality Alexander more than an experienced leader was an extremely lucky and able heir to the throne. Alexander is today revered and set apart from other leaders because of eurocentrism that still remains to this day. Alexander the Great was one of the greatest conquerors and tactical minds of all time, as evidenced by his large empire acquired with relatively small resources. He was inspiring and charismatic, his men would (and did) follow him anywhere. Beyond the conqueror, however, he took Hellenistic culture to an entirely different level; instead of the ideas of liberty, equality, philosophy, drama, and scientific categorization and study remaining in Greece and slowly spreading by basic trade and other modicums of idea osmosis, he spread it like wildfire across Asia Minor and the Middle East all the way to the Indian subcontinent. Very similar to Napoleon, except that Napoleon spread Nationalism, efficient bureaucracy, and a renewed vigor for republics. Both are great, but Alexander has to win in my book. His stunning and rapid record speaks for itself, brilliant commander and fearless. Conquered most of the known world, ruled Afghanistan, created one of the largest empires in history, all before he was 33. If he hadn’t dropped dead, he might have conquered the world. Out of the choices given I believe Alexander is the greatest leader. I thought of such greats as Bismarck, Washington, Napoleon, and Augustus, however Alexander was able to be a very successful military leader and politician. The others were either great commanders or political leaders, not both. With Alexander he was able to conquer lands with military tactics across the then-known world. The other candidates weren’t able to spread their military campaigns as far as he did as well as “liberate” territories such as Egypt. On the battlefield, Alexander, like Napoleon, gave the soldiers a dramatic surge in morale. However, unlike Napoleon, Alexander also understood the different religions, cultures, and economies of the territories he captured. Granted, like Napoleon they may have both been aggressive military leaders, but Alexander was able to gain a lot of respect worldwide by not just conquering but keeping a lot of the conquered areas in-tact. Because Alexander was able to conquer a lot of territory of the then-known world, allowing to keep their customs, inspiring his soldiers, and acknowledging economics impact by establishing Alexandria, I believe this shows that Alexander was a great military commander and political leader. Which is what makes him the greatest leader out of the choices. He commanded an elite army inherited from his father, but even so, it takes some talent to crush the greatest empire in the world. Furthermore, he managed to keep his Macedonians from bickering and plotting too much against each other – not bad when leading a people among whom political assassinations was practically a standard procedure and every ascension on the throne was followed by the killing of all those opposed and all rival claimants. He’s responsible for spreading Hellenic culture all the way to India; shaping the Classical Age single handedly. Julius Ceaser is noted to have cried at the sight of a statue of Alexander because he could never be a great a leader as Alexander. Also, a simple statement of military tactics that is attributed to Alexander; “Hammer and Anvil”. He liberated more than conquered, and fought in the wars he waged. Alexander III of Macedon (Alexander the Great) is the single greatest leader in all of history because he lead one of the grandest armies in the world and established one of the largest armies of antiquity. Dozens of the cities which he established still exist today, and the culture he spread and assimilated is very evident in the lands in which his empire existed. Truly, Alexander’s exploits have stood the test of time, and likely will remain standing until some other great leader buries them under blood and bone. Uncomparably vast feats in significantly short space of time that will forever be remembered and compared. Did the unimaginable by conquering the most powerful empire of its time, then pushing his army east into the unknown, spreading Hellenism and his name throughout the land. Alexander was a brilliant on-the-fly tactician, integrating units from disparate lands and cultures while also utilizing the terrain and his opponents tendencies to his advantage. He was a fearless warrior and took part of front line battles. Therefore, unlike many other leaders, he inspired his people better than a “regular” king of sorts would have done. He was also a tactical and stratetical mastermind. His exploits speak for themselves. He rose from a small kingdom to conquer the known world – and his reputation was so fearsome that decades after his death people still refused to revolt out of fear that he might really still be alive and come back to punish them. It’s a real shame that Ghengis Khan is not on the list, though. A huge empire in his lifetime with some splendid military victories. He helped unify most of the ancient world. And he was a certified military genius. Some of the combat accomplishments were quite amazing. Alexander was so young when he conquered the then-world that it puts all these other old fogeys to shame – a true child prodigy. He was a kind and fair ruler to his citizens, which held together despite the vast mix of cultures. It was only after he died that his empire crumbled, signalling that it was really him that was the key piece that held the empire together. He also defeated Darius III, another leader in this poll, something that doesn’t apply to any of the other leaders I think. Go Alexander the Great! Alex won every battle he fought. I believe no one else did that. Ceaser, Augustus, Gendis Khan all lost battles at one time. Alexander the Great never lost a battle ever in his entire military campaign all the way to India. Had he not died he could have made the Grecian Empire as great or greater than the Roman Empire that was formed years later. Alexander took the unity forged by his father in the Agean and with it conquered the colossus of Persia in 10 years and enabled Greek thought and language to permiate the entire near east and through the conquests of the Romans, extend throughout Western Europe, influencing all of modern history. He was the greatest and brightsest leader. He didn’t only conquered all the known world (for the greeks until that time) but he also focused on unifying them. He also used a lot of scientist during his quest including doctors engineers and many more. All together united under the commands of Alexander made the greatest empire the world has ever known in such a sort time (if we take into account the huge distances and the difficulty of transportation during that period) and by one ruler..
Run close by Napoleon, by to achieve so much in such a short period of time is something that is very hard to match, especially as the whole logistical side of what he did would have been far harder than Napoleon, plus he never lost. He was the first real icon for unity amongst all people, he had his flaws though but his idea & vision is something that would inspire many, and what he achieved being so young in short span of time was amazing aswell. Also one of his quotes or something that he showed. Nothing is Impossible,everything is possible, you just have to have the willpower to do it. To me, a leader is one who provides a strong example of how followers should live and believe, not necessarily how they must. I think Alexander fits this bill very well. Not only did he utilize the military advances his father developed to defeat the most imposing army and empire of the time, often leading assaults himself (much to the worry of his officers and troops), but he then tried to join the cultures of Greece and Persia into a greater whole. To advance this idea, he even married a woman of that eastern empire and encouraged his followers to do so as well. When he led his soldiers to the Indus River and they decided that they would go no further, he let them have their way. Unfortunately, many woes befell them during their return to Babylon, and later, Alexander failed to consolidate his dream for a combined east-west empire, but his conquests did help Greek culture thrive and survive through the middle ages, the crusades and on to inspire the Renaissance. He conquered most of the known world at the time with ease, all before he died young. He was known mainly for his military skills. It may be true that without his father, Phillipous the second of Macedonia, Alexander the Great would not have been that great. However the reported historical fact depict him as an intelligent and charismatic personality, understanding complexities that go beyond simple strategy and tactics. He used the conquered lands, sent back to Europe a great variety of plants and animals that did not existed and bringing them a lot of the advantages that the Greek city-states had developed. He build cities all around the then known world in strategic locations, many of which continue to prosper. He allowed the conquered nations to continue their existences without forcing a religion upon them. And above all he did all this with minimal resources, always involving himself in all the aspects of his military, economic and cultural campaign. He brought forth an age of contact between nations that ignored each others existence and is rightfully remembered as Alexander the Great. If that is not a sign of greatness, I do not know what is. He conquered all Greece, then Egypt, Persia, India… that makes a huge empire with so much victories during a so hard period of the History. Desire of territories was his main objective as an explorer and he will stay in the History by Alexander the great who makes Macedonia has one of the most extensive territories of all time. None other in this list have realy had the same long time effect og his rule, making sure that greek culture became so dominant and making sure Rome herited it. Also he’s seen as a great figure not only in the “western” world, but in the middle east and India as well, and few have had as brilliant military careers as he have. Because of introducing the psychology of the God/Man King, and using it to his advantage in warfare and conquest, while at the same time inspiring the world with advances in the sciences and mathematics. As a single man, none have accomplished a greater feat; the only man who might offer a challenge in terms of pure military conquest, Ghengis Khan falls flat on his face when one considers the cultural effect as a legacy of conquest, and between the two, i think its fairly certain that through modern eyes, it is far more easy to see Alexander, the Philosopher-King as perhaps the greatest ruler our little species has so far produced- had he lived longer, what else might he have done to make his legend yet greater then it already was? Took over most of Europe and much of Asia and Africa. Was loved by his people. Ahead of his era and forward thinking in the fields of art, religion, architecture, city planning, and many other cultural and technological fields. A military genius and a man that was wise enough to know when to consult others in areas where he did not know himself. The battles he won, the enemies he defeated and the subjects he gained. In a few short years he forever became the benchmark for being called great. Did the unimaginable by conquering the most powerful empire of its time, then pushing his army east into the unknown, spreading Hellenism and his name throughout theland. Alexander was a brilliant on-the-fly tactician, integrating units from disparate lands and cultures while also utilizing the terrain and his opponents tendencies to his advantage. Alexander the Great is the biggest general not only by military point of view as with a small army but well equipped and organized and with a capable general stuff of generals to assist him, managed to conquer and abolish the biggest empire of the known world at that time but also spread the greek culture to the East and created the hellenistic culture which had the well known impact in all aspects of our Civilization.Don’t forget that Alexander brought with him in his campaign various scientists,filosophers,etc.Moreover he was the first to unite his greek compatriots and make them focus in one scope:the abolishment of persian threat over Greece. “Julius Caesar said he could never be a general like Alexander” – and that’s one of the reasons why he was greater than Alexander. Caesar was a natural leader, a writter, mathematician, architect, lawyer, general, soldier, and politician. And at all of those fields he was superb. Alexander was a good general, and a terrible king. Instead of governing conquered regions, he only wanted more. By the way, the information on Alexande never being defeated comes only from his own sources, while other sources in India indicate that he was defeated there. What about Genghis khan? He not only conquered more land and greater empires but also was able to establish a lasting empire that didn’t disappear after his death but flourished for centuries. Like Napoleon, Alexander was a genius on the field only and failed miserably to take care of his soldiers and to establish an empire on solid ground. Though Khan was quite cruel to people if they didn’t surrender to him, neither would Alexander, who was just as cruel, so I don’t really get why people go nuts over Alexander and ignore Genghis Khan. Julius Caesar and Augustus were greater than Alexander. Alexander won many places but his victory was always short-lived. It has no lasting effect. In fact many stories he himself invented to praise himself and to pretend like a God. Yes, Alexander was a great leader and a great general. He had a vision and risked everything to achieve it and when that vision was accomplished he moved on to another to advance and secure those and new goals. His greatest achievement was introducing and developing trade throughout the known world and introducing vast new knowledge and trade to all areas they in countered! He left his bias behind and learned. As for the greatest military mind? It matters not, it only matters that you defeat the foe your against at the time. How can anyone clam being the greatest? Were they great because the enemy leadership inept or was the foe they defeated run by another great leader? I’m no historian but find a commander facing long odds, a better equipped enemy, led by a brilliant leader, who prevails and only then can you even begin to put their name in the discussion. If you win every battle and yet lose the war? Actually he mysteriously fell ill.
but could not penitrate into bharath … what is called india now. when did a war with purushotham…..
he left his kingdom back to him and went back…..
seems…. the bharath culture made him to satisfy him. He defeated an army of 1 million with an army of 40,000 in open combat, he won outnumbered 25-1. The church didn’t come into the picture until around A.D. 30-40…..
Alexander, over the course of a relatively short thirteen years, conquered all of Persia and began the process of taking over the entire continent of Asia. Alexander was able to conquer such a great feat at a very young age because he was incredibly ambitious, whether or not this is truly a good quality for a leader is debatable, but it is undeniable it contributed to his success. Alexander unlike many leaders of previous wars always took to the front lines with his men. He wasn’t the type of leader who gave dramatic speeches in an attempt to inspire his men; He knew that if he expected his troops to risk their lives for this cause he would have to do so as well. Alexander was not the most moral man. After all, he killed one of his best friends while highly intoxicated because he would not bow down to him. But he was certainly a great military strategist and a prime example of the traits necessary for a good leader. Military regiments, students, and professors all over the world still study his tactics and procedures. Alexander was a not a great man in the moral sense but it is indisputable that he is a one of the greatest military masterminds.. And one to prove people wrong. Yes Alexander the Great was a genius military leader. Legend says that Alexander wanted to cross the Hydaspes River. Porus was on the other side of the river. Alexander being a smart military leader he had a plan to get across the Hydaspes River. Alexander the Great tricked Porus many times that they were going to fight. When Porus got tired of this. When Alexander wasn’t tricking them. Alexander the Great charged at Porus. Porus got confused and didn’t react to the attack. This relates to my thesis because it states why Alexander was smart/genius military leader. He definitely had the greatest run in history. Many generals perhaps had genius, but none had Alexander’s bravado. He also had a low causality rate among his troops. As it happens, Alexander had both. His logistics alone put him another category of greatness. He led a functioning army all the way into the unknown in hostile territory…and kept winning. If King Philip was alive to beat Darius there’s no way he wud have fought his way into India. Alexander was battling his way into the East in the name of exploration among his other obsessions. But hey guess what, you don’t know who won the greatest fight, Porus vs Alexander. Also, int the movie Alexander, Alexander and his army ran away seeing the Indians riding elephants. So what you gonna do about that, also it was discovered but not spread that Greek historians tried to tamper with this fact to make the Greek leader look better. This website needs to know more about Porus’s true history and backstory. Knowing this ill have an impact on who won the fight. oh yeah because im sure that the movie Alexander is gonna be more accurate then a history website. Check out Bai Qi (Circa 331-257 BC). In his 50 plus years career, Bai Qi won over 70 campaigns and never lost a battle. He killed more than 1.5 million enemies and earned the nickname of “The Butcher.” His victories laid the groundwork for the Imperial China. However, when he became too arrogant his king ordered him to commit suicide, and the Butcher slit his own throat.